In the moments leading up to Friday's weigh in, there was news that junior featherweight champion Jessie Magdaleno was having difficulty getting down to the 122-lb. limit. He was going to arrive a little late to the weigh in, presumably to finish shedding the remaining ounces needed to get to 122. When he finally made it to the scales, there was a sigh of relief from a few in the promotion when he weighed in at 122 lbs. on the dot. A little more than 24 hours later, Magdaleno collapsed in a heap during the 11th round. Referee Benjy Esteves provided a protective embrace upon the fallen fighter and waved the contest off. After the bout, Magdaleno's promoter, Bob Arum, announced that after time off, Jessie would continue his career in the featherweight division, four pounds north of where he fought on Saturday. Struggling to make weight is common in boxing, but it doesn't necessarily lead to a loss. During the lead up to his fight with Julius Indongo, Terence Crawford had similar problems making weight and shortly after the bout announced that he would move up to welterweight. Jermall Charlo was outgrowing the junior middleweight division and moved up to middleweight after his fight with Julian Williams. However, both Crawford and Charlo won their fights by KO; in fact, they made quick work of their opponents (perhaps they knew that they had to). Magdaleno started Saturday's fight against Isaac Dogboe in similar fashion to Crawford and Charlo, scoring an early knockdown. He landed a series of power shots toward the end of the first round (one of them was also a rabbit punch) and Dogboe fell to the canvas. However, Magdaleno didn't go for the kill after his initial success and Dogboe worked his way into the fight, landing a number of scorching right hands and solid body shots. In fact, Magdaleno didn't fight like a physically compromised athlete in the early stages of the fight. He tried to win the fight as a boxer/puncher, often using his legs, lateral movement and short power shots to score. But as the rounds stated to pile up, Magdaleno was using his legs far less often. Although he had success on occasion boxing from the back foot, he also spent too many portions of the fight in retreat or stuck along the ropes – two potential indications of fatigue. In the fifth round, Dogboe landed a sizzling counter right hand that dropped Magdaleno to the canvas. That exchange further confirmed Magdaleno's decision to engage selectively. Magdaleno did a fantastic job surviving the round but whatever early advantage he had in the fight was by now long gone. As a young prospect, Magdaleno was quite the offensive dynamo. Charging forward with ferocity and fast hands, he was one of Top Rank's rising stars. After a difficult fight against Nonito Donaire in November of 2015, where Magdaleno won his first world title belt, he would go on to fight only one more time in the next 17 months. Some of that inactivity was due to a hand injury. Another portion could be attributed to the realities of the boxing business, and perhaps an admission that Magdaleno was no longer the gym rat that he once was. Even though Magdaleno had considerable boxing skills as a young fighter, it was a strange choice to see him try to beat Dogboe in a slicker, more defensive style. 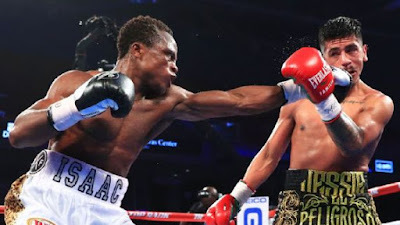 Dogboe consistently landed strong, lead right hands and Magdaleno wasn't evasive enough to avoid Dogboe's punishing body attack along the ropes. One attribute of a winning, defensive fighter: don't get hit that much. Perhaps the answers to Magdaleno's decisions in the fight could be explained by the events in the 11th round. Dogboe trapped Magdaleno in a corner and then landed a borderline right hand to Magdaleno's midsection. Dogboe continued his flurry, connecting with two more right hands, the last of which sent Magdaleno to the canvas for the second time in the fight. After the action resumed, Dogboe forced Magdaleno back to the corner and started going to work on Magdaleno's body, landing six or so right hands and three left hooks. Eventually, a left hook to the head sent Magdaleno to the canvas and he collapsed to his knees. Esteves ended the fight without a count. It should be noted that Dogboe's final blow was not a particularly hard shot; however, the preceding body shots certainly were. It was almost as if Dogboe literally beat the fight out of Magdaleno in the corner. Where Magdaleno held and used veteran tricks to survive the fifth round, in the 11th he couldn't even be bothered to use delaying tactics; he was ready for the fight to be over. And it wasn't as if he was making a noble final stand; he was just getting pulverized in the corner. Magdaleno has been well trained by Manny Robles. Surely, he knows how to tie up, foul, hold or use any and all available methods to survive – he had exhibited those skills beautifully in the fifth round. But in the 11th, he yielded: first mentally, then physically. 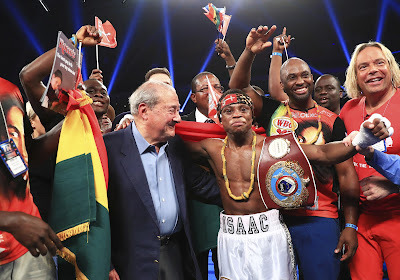 Let's give credit to Dogboe who displayed a ferocious right hand and the intensity to match throughout the fight. His power shots and aggression eventually led to Magdaleno succumbing. But let's also note that Magdaleno defeated himself in portions of the fight. He abandoned the offensive style that had led to his success in his career. Perhaps physically and/or mentally he felt that he wouldn't be able to engage in a war, or that his body wouldn't hold up with that style over 12 rounds. However, he wasn't prepared to fight 36 minutes by ceding ground either. His performance certainly wasn't a disaster. He won some rounds. He landed impressive left hands and right hooks at points, but he lost the ring generalship battle, which directly led to his defeat. Dogboe wasn't the opponent to try a new defensive style for winning a fight. Overall, the fight delivered – knockdowns galore, momentum swings, power connects. American audiences were introduced to an excellent, young (23) talent from Ghana with a TV-friendly style. Dogboe could make for some scintillating fights in the junior featherweight division over the next few years. As for Magdaleno, perhaps a move to 126 will help him physically. Making weight is one of the toughest aspects of boxing and he may feel much stronger at the featherweight. But I can't get past the fact that Magdaleno needs to have an honest talk with himself about his future as a boxer. Yes, it's just one loss and losses happen all the time, but it was the WAY that he capitulated that was troubling. Everyone can have an off night or be far from their best physically. But Magdaleno ended the fight meekly, as a boxer who didn't want any more. That's certainly not going to inspire him (or his team) the next time he's matched tough. 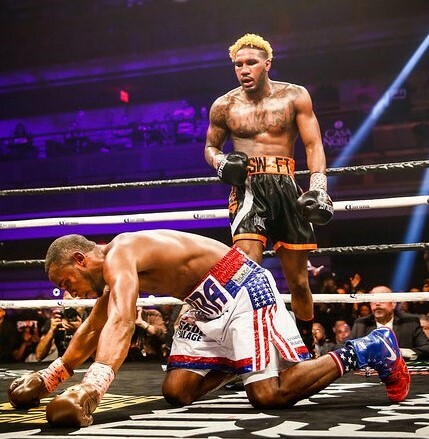 In the co-feature, super middleweight Jesse Hart thrilled his hometown Philadelphia fans by pounding out a seventh-round stoppage over Demond Nicholson. If one were to watch a montage of Hart's best moments from the fight, he would look sensational. He scored three knockdowns and landed eye-catching right hands at various point in the bout. But, highlights aside, there were also moments were Hart looked flustered in the ring, allowing the over-matched Nicholson to beat him to the punch and take the initiative. In Hart's highest-profile bout as a professional, he was perhaps seconds from being knocked out in a title challenge against Gilberto Ramirez. Instead of yielding, Hart dug deep and fought back, winning several of the fight's latter rounds. Perhaps the precipice of defeat helped clarify things for Hart that night, for his only task was to survive, and he couldn't hold his way out of the match for the next eight rounds; he had to fight back. When Hart has been the better fighter in the ring, he often has lapses. He'll give up rounds, allow opponents to get free shots, and not take foes seriously. He almost got knocked out by journeyman Dashon Johnson doing just that in 2016. Hart doesn't really know what he wants to do in the ring. He has a powerful right hand, athleticism, and solid boxing fundamentals, but there never seems to be a plan in place. He's too eager to let fights devolve into a battle of machismo. He falls for traps. In addition, he's not particularly patient in the ring. If something's not working, let's say his jab, he'll abandon it. He's a frustrating fighter to observe because it's hard to know what his ceiling is. If he someday puts it all together (which at 28 better be soon) then he could be a real threat in the super middleweight division. But it's far more likely that his recent string of performances will be par for the course. He will stop fighters a rung beneath him and struggle to find ways to beat the best in the division. Perhaps he is destined to wind up as a game B-side. And let's not look down upon that, boxing needs those guys too. Former heavyweight title challenger Bryant Jennings won a unanimous decision over fellow Philadelphia Joey Dawejko, avenging a defeat in the amateurs. The fight went according to plan with the lumbering Dawejko having some success early in the bout before Jennings's superior conditioning took over in the back half of the match. It was a workmanlike performance from Jennings, who won the fight essentially with just his jab and a few well-placed power shots. After back-to-back defeats against Wladimir Klitschko and Luis Ortiz in 2015, Jennings spent 20 months out of the ring, with much of that time embroiled in promotional issues. Eventually he signed with Top Rank and they have kept him busy. Saturday was his fourth fight in eight months. Following his victory on Saturday, Jennings talked with various members of the media on press row. On one hand, he was pleased with the win and thought he had won eight of the ten rounds (the judges agreed with him). However, he also noted that what he's been working on in the gym with trainer John David Jackson hasn't fully manifested yet in the ring. Jennings is a solid athlete with a good jab. However, he lacks a true knockout punch, and he knows it. Jackson has been working with Jennings to trust in his power, but that belief is not there yet. Dawejko was the harder hitter of the two on Saturday. When Jennings tried to slug it out in the middle of the ring, he was often beaten in exchanges. Unfortunately for Jennings and his promoters, Jennings is at his best when he's on his bike. It's a negative style and it results in fights that aren't often thrilling to watch. I'm sure that Jackson also knows that Jennings's style can't last forever as the fighter (now 33) continues to age out of his physical prime. In addition, he realizes that all boxers, regardless of their athleticism, have to be ready to fight, and win those moments. There are still growing pains for Jennings and Jackson and it's unclear if the pair will coalesce to bring out the best in the fighter. Right now, it appears that they aren't fully in sync yet. Perhaps Jennings has one or two more fights to get everything in order. But I'm sure that he wants another crack at real money sooner rather than later, and that will involve a bigger risk than Joey Dawejko. In just a short time as a pro, Shakur Stevenson has made significant strides. On Saturday he fought Patrick Riley, an unbeaten boxer who could handle himself in the ring. To many it seemed that Riley would be Stevenson’s first real test in the pros. Well, throw narrative out the window because Stevenson destroyed Riley in two rounds. In Stevenson’s first few professional fights, he won because of his superior hand speed, reflexes and athleticism. But on Saturday, it was Stevenson's power that did the talking. He threw sharp straight left hands and right hooks. He dug to the body with thudding shots. But perhaps more important than his power shots was his belief in them. Stevenson fought Riley mostly in the pocket, which was a welcome sign of maturity. Instead of over-moving, he was leading and countering from range. He was ready to punish Riley for mistakes and initiate his own offense whenever he saw fit. He had a fantastic moment in the second round where he feinted a jab to the head and came downstairs with a punishing left hand, a scintillating mixture of intelligence and power. After the fight, I talked with a Top Rank executive who was thrilled with Stevenson's performance. Yes, Shakur has the hand speed, the athleticism and the Olympic medal, but if he can further develop his power...well, we know how this goes – everyone loves knockouts. If Stevenson continues to add power, the sky is the limit for him, and it still may be even if he doesn't; he is that talented. When the PBC launched in the first quarter of 2015, boxing power broker Al Haymon had more than 150 fighters signed to either a management or advisory contract. Big names such as Keith Thurman, Deontay Wilder, Danny Garcia and Adrien Broner were among the featured boxers representing the organization. Those fighters and many others were dispersed to various networks as headliners. In addition, the PBC offered television opportunities to a number of young or under-the-radar boxers, often on Fox Sports 1 developmental shows. To this point, a few of those fighters have graduated to the big time. Yordenis Ugas has become a player in the welterweight division. Jamal James might yet become one. But without question, Jarrett Hurd is the best success story to emerge from the PBC's developmental pipeline. Hurd, now an undefeated, unified junior middleweight champion, was only fighting eight-rounders when the PBC launched and didn't even have his first ten-round bout until the end of 2015. Flash forward to the present and he has wins over perhaps the best talent at 154 lbs. (Erislandy Lara), a former champion (Austin Trout), and one of best fundamental boxers in the division (Tony Harrison). What makes it all the more interesting is that Hurd can't come close to approximating the traditional boxing skills of those vanquished foes, yet he has found a winning formula; he has quickly become one of the best pressure fighters in the sport. As Hurd progressed in his career, he defeated notable prospects such as Oscar Molina and Frank Galarza. At that point, he was a pocket fighter with height, a good punch and some raw fundamentals. He was seen as an intriguing physical specimen (6 foot 1 with a 76-inch reach), but few thought of him as a fast-riser to a world championship. Sure, he was an athlete. But did he have any idea of what he was doing in the ring? In watching Hurd's development into a pressure fighter, I'm immediately reminded of Shawn Porter. Throughout Porter's early professional years, he couldn't settle on a ring identity. He could box, brawl, pressure or stay in the pocket, but frequently he tried to do all of these things in the same fight, leading to a lack of fluidity in the ring and some choppy performances. However, as he continued up the ranks, he belatedly found his calling as a pressure fighter. Starting with his title shot against Devon Alexander in 2013, Porter applied constant pressure in the ring. His approach yielded success, earning a championship belt. In subsequent years, he further refined his skills as a pressure fighter. Today he has established himself as one of the toughest competitors in the welterweight division. For Hurd, the Tony Harrison fight was the turning point in his career, similar to what Alexander was for Porter. Hurd couldn't match Harrison's fundamental skills and movement. Harrison's jab landed at will and his movement baffled the cruder Hurd. Harrison swept the first six rounds of the fight. On one level, it was easy work, Harrison wasn't getting touched much and he put on a boxing clinic as he racked up round after round. But Hurd wasn't discouraged. Despite being down in the fight, he never got flustered. He made Harrison work every second of each round. By the seventh round, Harrison stopped moving as much and Hurd was able to land some big power punches. By the eighth round, Harrison looked like he was ready to be stopped. In the ninth round, he was. The same formula was applied in the Trout fight. Trout dominated the early rounds and looked fresh and buoyant in the ring. Slowly but surely, however, Hurd was successful at closing the distance. By the 6th round he was teeing off with some enormous right hands. Hurd continued the onslaught in the subsequent rounds and the fight was eventually stopped in the 10th. Last Saturday's bout against Erislandy Lara had similarities to the Harrison and Trout fights, but Lara was able to make it to the final bell – just barely; he was knocked down in the final round by a crushing right uppercut/left hook combination. Overall, the fight was a fantastic slugfest, with Hurd doing just enough to win by split decision. Lara landed his best punches against Hurd: wicked left uppercuts, stinging left crosses, and the types of overhand lefts that broke Alfredo Angulo's eye socket. Hurd, not a defensive marvel by any means, withstood Lara's power shots, although they had a real effect on him in the ring. The fight was certainly not one-way traffic. Lara won a minimum of five rounds and many others thought that he was successful enough to capture as much as seven. Also consider that Lara's not a jabber at all; everything that he throws is with power, and lots of it. Unlike his most recent outings, Hurd wasn't merely a crude pressure fighter on Saturday. By the third round, he had goaded Lara into staying in the pocket. Hurd also wisely kept moving to his right, which cut off Lara's leftward movement, his favored way of navigating the ring. These aspects of Hurd's performance on Saturday demonstrated a strong Ring IQ. In short, he didn't win just by brute strength or force, but also by cunning and ring craft. As Hurd has taken to pressure fighting, he has demonstrated significant improvement with the style. No longer walking in with his gloves down and with lumbering footwork, his movements were purposeful and strategic against Lara. He was well prepared and understood what he needed to do to win. Hurd and trainer Ernesto Rodriguez had a winning game plan and he executed it in fine fashion. One advantage that Hurd has over other pressure fighters is a full arsenal of punches. He has a powerful right hand, a sharp left hook (an improving shot) and uppercuts with both hands. He can jab when he needs to and goes to the head and the body. He also varies the speed and force of his punches, keeping his opponents guessing (Leo Santa Cruz is also very good at this technique). He can start combinations with all of his punches. He threw a four-punch combination of all right uppercuts against Lara. When Hurd's in close, he's not predictable. 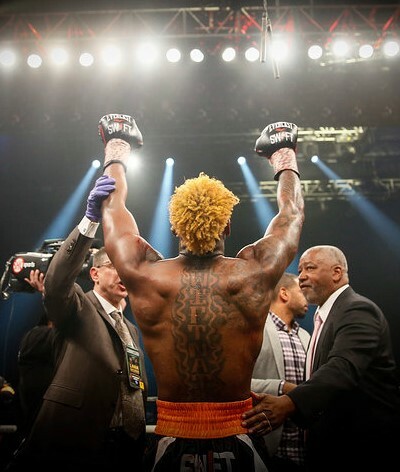 With little fanfare or hype, Hurd has become one of the more exciting fighters in the sport. Later this year he could find himself in a second title unification match against Jermell Charlo, another boxer who has improved significantly in recent fights. At 27, Hurd is in his athletic prime; however, he's still very much an unknown. With the lack of publicity surrounding his career, it would be far-fetched to see him emerge as a bona fide star who could transcend the sport. But within boxing, Hurd creates thousands of new adherents every time he fights. With a willingness to take on all comers and a fighting style that plays excellently on TV, he should become a staple of Showtime Boxing over the next few years, irrespective of whether or not he defeats Charlo. Boxing never loses its ability to surprise. For every Omar Figueroa who was prematurely anointed as a star, a fighter from nowhere (actually, a suburb of Washington D.C.) emerges to win fans over the proper way: beating top opponents and looking good in the process. Still so little is known about Hurd. He gave up boxing in the amateurs for a while. He still lives at home with his parents. He...he...he...Well, that's about it. There's a gap here that needs to be filled by his team and handlers. Hurd is a compelling figure in the ring; might he be something special outside of the squared circle? Does the fire burn inside of him to become the best? Is boxing just a gig for him? Will he take long hiatuses from the ring to learn the flute? What does he want? In due time we will have more biography and a sense of who Hurd is as an individual. But as we wait for more, boxing fans can rejoice, as there's another reason to turn on the channel on a Saturday night, a new fighter to circle on the calendar. Hurd is ample proof of the first part of Larry Merchant's famous quote: "Nothing will kill boxing, but nothing can save it." Because of fighters like Hurd, the sport can regenerate itself. His efforts create new fans. And there is no higher praise.